Photo posted on Facebook by Jewell James. This article is based on a piece  written by Clayton Thomas-Muller and Attiya Jaffar for 350.org, an organisation building a global climate movement, and is republished on Global Voices as part of a content-sharing agreement. On August 23, a 22-foot totem pole left the Pacific Coast of the US state of Washington on a 5,000 mile journey to Canada. 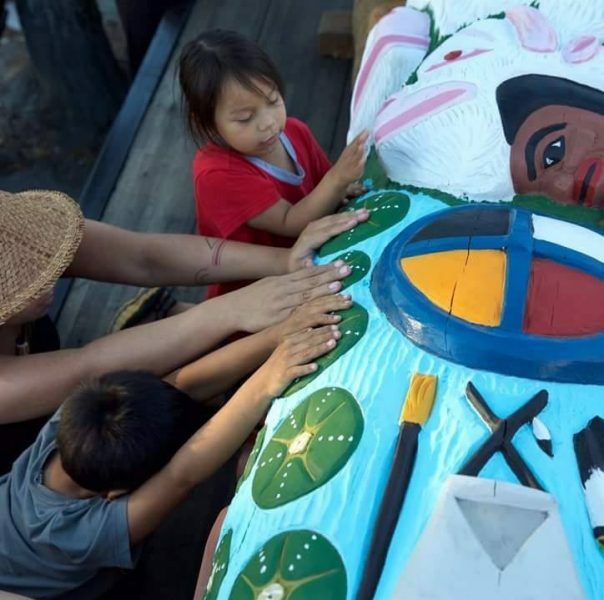 This marked the fourth year that the Lummi Nation, a Native American tribe, had organized a “totem pole journey” — a mission to “strengthen and expand ” alliances between Indigenous peoples active in the resistance against the fossil fuel industry. Earlier this year, the Lummi Nation celebrated a huge victory when it successfully blocked the largest coal port ever proposed in North America . Now, by sending this totem pole as a gift to the Treaty 1 people in Winnipeg, Canada, the nation is standing up in solidarity with the Indigenous peoples leading the fight against the Energy East tar sands pipeline, the largest proposed oil pipeline on the continent. Once raised in Winnipeg, the totem pole is meant to “bear witness to the need for all peoples to work together in the name of our common humanity and our covenant with Mother Earth ,” according to the totem pole journey website. We need to let them know they cannot in the name of profits do this to the people, the water, the land, and to the future generations. We will never give up. The totem pole journey began with an intimate blessing ceremony in Bellingham, Washington. Soon afterward, it made a stop in Seattle before it set off eastward. Meanwhile, in Canada, community members in Winnipeg who are active in the struggle against the Energy East pipeline prepared to receive the gift. Watch Clayton Thomas-Muller from Winnipeg , Canada, speak on Facebook about the community’s plans for receiving this enormous gift. En route to Winnipeg, as an expression of solidarity, the totem pole journey ceremoniously stopped at numerous hot spots of Indigenous resistance to oil, coal and gas. This included a visit near Vancouver, Canada, to the T’Sleil Waututh Nation — another community fighting tar sands expansion—and a blessing stop in Missoula, Montana. 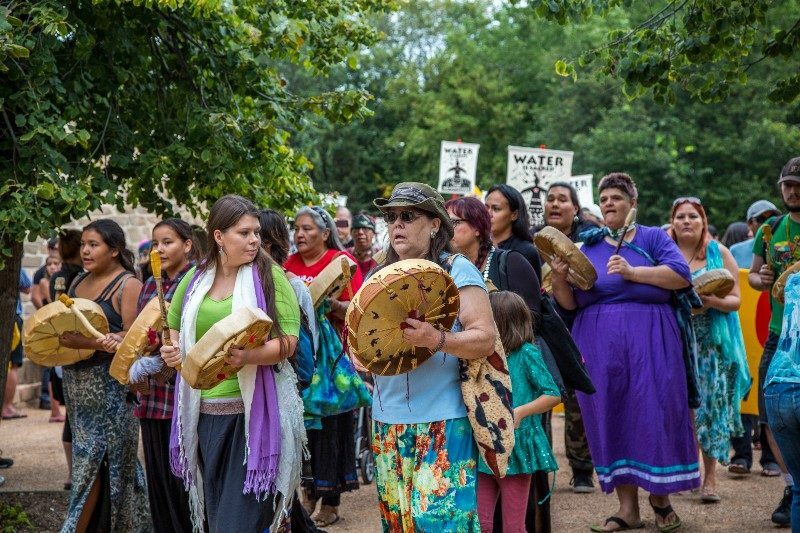 Most notably, the journey made a stop at the Sacred Stone Camp to show solidarity with the Standing Rock Sioux Tribe which has been leading the iconic battle against the Dakota Access pipeline. “They’re exercising their religious freedom, freedom of press, freedom of speech, freedom of assembly — the right to speak out,” James said. In video on Facebook, members of the Lummi Nation speak on showing solidarity  with the Standing Rock Sioux tribe. 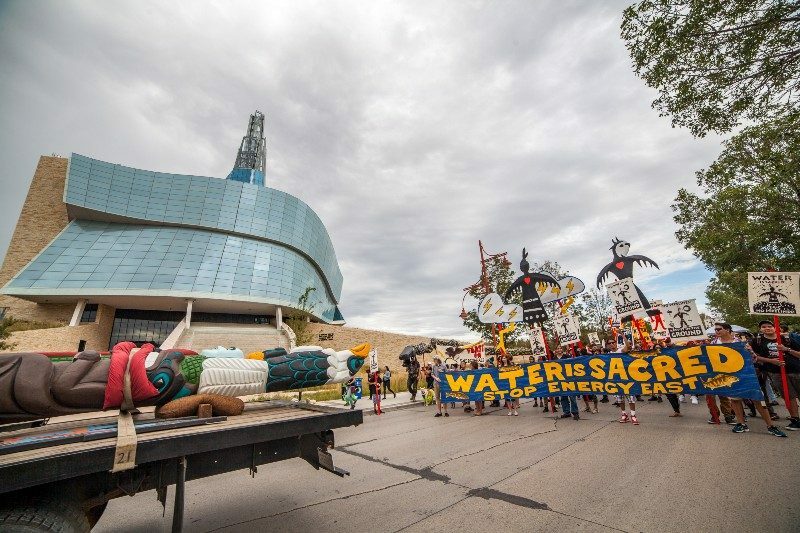 As the totem pole headed north towards Canada, hundreds of people in Winnipeg spent the weekend creating art in support of the climate movement. Many of the designs for the banners and the flags were produced Isaac Murdoch . At last, it reached its destination on September 5. Thousands of people were there to receive the totem pole with the utmost respect and enthusiasm. 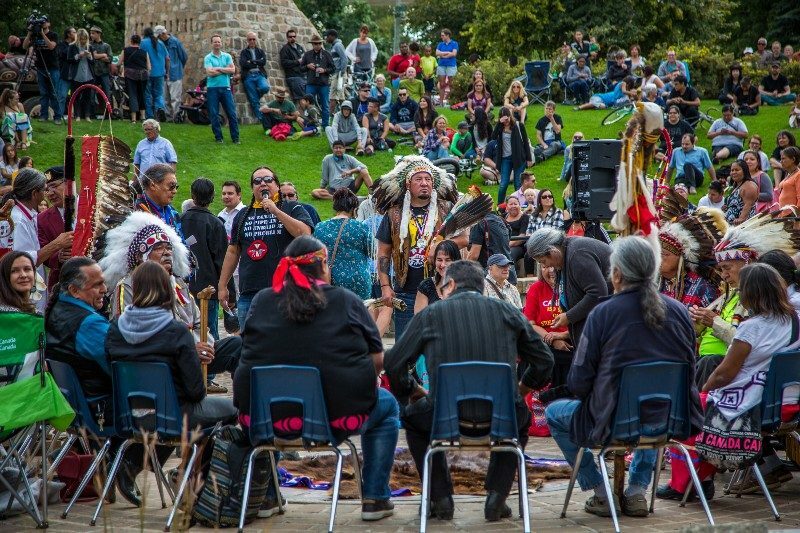 The Assembly of Manitoba Chiefs along with friends of the community hosted a large public event in Winnipeg that day to honor the arrival of the totem pole journey. The celebration focused on the growth of the alliances among nations and the shared goal to work towards a clean energy future. 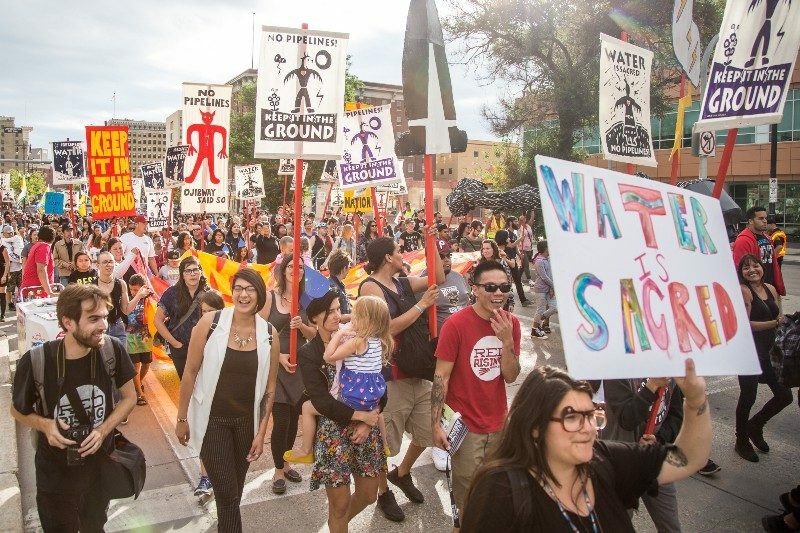 Together, Jewell James and the people of the Lummi Nation marched with the people of the Treaty 1 territories, brandishing messages for environmental justice, respect for Indigenous sovereignty, and the sacredness of water. Under the guidance of elders and ceremony, the fourth totem pole made its way down Main Street  in Winnipeg. 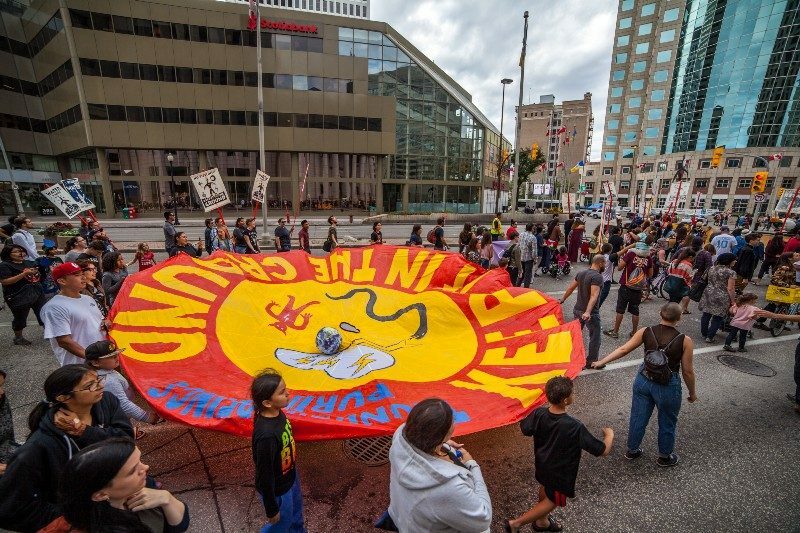 Along the way, the marchers stopped for a round dance at Canada’s most iconic intersection — Portage and Main. The following day, on September 6, the totem pole was raised on the sacred lands at the Turtle Lodge in Treaty One Territory. Drumming, dancing and ceremony accompanied this majestic moment. You can see video of the moment  on Facebook. At last, this gift from the Lummi Nation’s House of Tears Carvers Society stood as a symbol of Indigenous resistance in the path of the largest pipeline ever proposed in North America — the Energy East project.